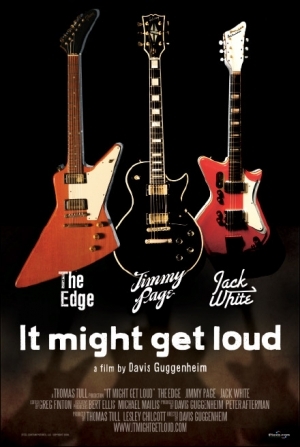 In our classes last quarter we were watching a film called “It Might Get Loud”. It was about these three really cool and unique guitarist that have played or still do play in famous bands. The three guys were The Edge from U2, Jimmy Page from Led Zeppelin, and Jack White from The White Stripes and The Raconteurs. It told all of their stories of how and why they became guitar players. I really liked Jack White’s perspective on life and music. The whole minimal lifestyle thing is pretty cool. Watching him build that guitar with one string on his porch was amazing. He believed that people cared to much about having a nice guitar before they could actually play it. If you can’t play it’ll be bad either way but if you good it’ll sound good no matter what. The Edge was really cool as well. He was the polar opposite person to Jack White. He likes to listen to the parts he can play using a crazy amount of effects because it makes it sound like two guitars are being played at once. Jimmy Page all I have to say is this man is a legend. You already knew that though. He played in Led Zeppelin! He seemed like a really down to earth dude. He was the most traditional guitar player out of the group. Out of the three Jack White is the youngest person in the person but that just means he has the most to prove. Jimmy Page and The Edge both play the role of sidekick to the legendary vocalist that are the frontman of their respective bands. While Jack White seems play the role of both the sidekick and frontman. The jam sessions in this movie were the coolest thing ever. It feels like you were really there watching these three legendary men throw out all of their emotions into this amazing jam. If you play guitar it made you want to join in on it. If you don’t play guitar it’d probably make you want to learn. It showed you that they are still people as well because they weren’t arguing like I’m from Led Zeppelin so that makes me better than you. I really like to see famous artist with their ways of thinking. Overall it was a really cool story about the rise of these amazing guitarists. The camera work was really cool. They changed the style of the shots on the person they were following in that shot. It was a clever Idea. The shots during the jam sessions just intensified the emotion and raw talent of the performance. The way they shot it felt like you were almost there. The sound on the movie was pretty great as well. It didn’t sound like we were sitting in a lecture hall listening to a movie. It sounded as if they were performing for us in the lecture hall. I really enjoyed just about everything this movie had to offer. I would give it a five out of five if I could. It will also be going on my list of movies to buy. Starting a business is guaranteed to be a thought in almost every student’s mind while in college. It is never too early to start making plans, or start building the business that they wish to pursue. In his 2nd quarter and her 5th quarter at the Institute of Production and Recording, Kody Flynn and Lindsie Heitzman started their plan for their business: AM-J Studios. 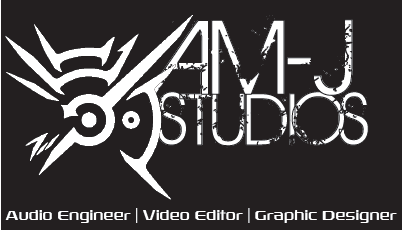 The beginning of AM-J Studios will mainly focus on one aspect of the music industry: acting as a recording studio. Kody will be Head Engineer (engineering and producing all of the clients who are with the company) while Lindsie will be the Studio Manager (dealing with the contracts, scheduling, and budgeting of the studio). As they work to get themselves more clients to be working with, they will keep the business to strictly a two-person company. Everything that needs to be done is going to be done by them for as long as they can keep it up, and afterwords they will hire people under them. When AM-J gains more recognition and makes a name for themselves as a business, they will officially establish themselves as a business through the Minneapolis Business Bureau all the while branching out into all the fields of the industry that they wish to acquire. On top of being a recording studio, AM-J will eventually branch out to be a full-on record label (with added benefits). AM-J’s goal as a business to be an all-in-one entity for the artists it represents. Clearly, AM-J (the recording studio) will have loyal clients who record with them. If said artist is unrepresented and AM-J feels confident in pursuing this artist, the artist could also chose to/be offered to be signed under AM-J records. Within the record label side, AM-J will promote and help further the artist’s reach in their market. AM-J starts now, and will do nothing but expand from here on out.